Uppermoda is Featured in Croatia Week! Home Latest News from uppermoda Uppermoda is Featured in Croatia Week! We are so excited to be featured in Croatia Week! If you want to learn more about why we took the leap of faith to fulfill one of their dreams, check out the article below. An e-boutique, focusing on promoting Croatian designed and made fashion to customers worldwide, is proving to be a hit downunder. 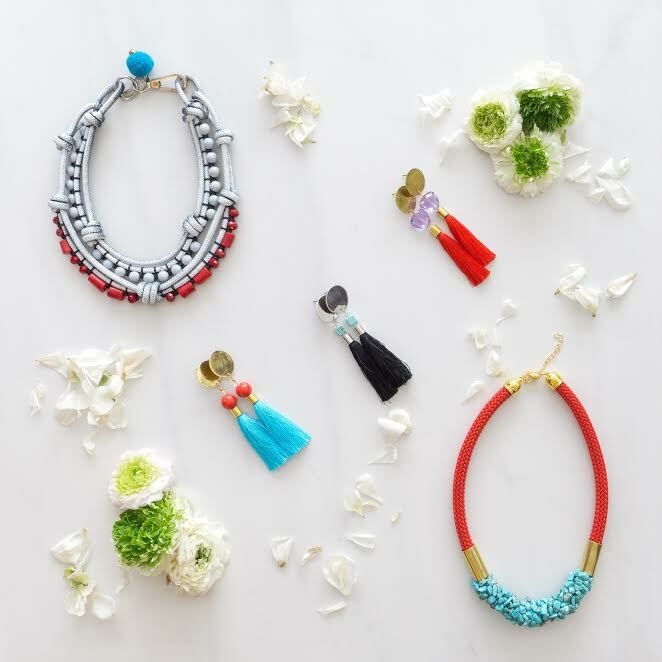 Working with small designers from all over Croatia who make something different, Uppermoda sell fashion accessories and specialize in different kinds of jewelry from necklaces made from nautical rope to large statement pieces great for a night out. In addition, Uppermoda sell leather handbags made from Italian leather, bow ties made from cotton & satin as well as other fashion accessories including bracelets, earrings & chokers. “We are also very excited to feature traditional clutches and tote bags with Croatian patterns that have been a success with the Croatian community in Australia. As a start-up just over 7 months old, our primary focus has been on Australian & New Zealand customers however we offer worldwide shipping too,” Meagan Hadusek, who founded Uppermoda with her husband Michael, told us. Meagan also reveals how the idea turned into a reality, the successes and the couple’s future plans. Michael has a Croatian background and has spent an extensive amount of time in the country visiting family. In 2013, Michael and I traveled throughout Croatia and we decided to hold our wedding in front of family & friends in the beautiful city of Dubrovnik. During our trip it was evident that Croatians were at the forefront of fashion trends. The concept of Uppermoda developed when we visited a boutique specializing in Croatian handmade items. The owner explained that the talented designers come to Hvar every year during the peak tourist season to sell their products and spend the rest of the year designing and producing these products at their home. From this moment we knew that the talented Croatian designers had something unique and special to offer. It was over a coffee and cake that Uppermoda was born. Our ambition was to begin a business that would help Croatian designers expand their reach year round while providing fashion conscious shoppers in Australia and New Zealand something unique that would ensure they feel special and stand out from the crowd. Today, we are proud to say that we are working towards that goal with the launch of Uppermoda in August 2016. What has been the best thing to date about Uppermoda? We still get really excited whenever we hear a sale come through our online store. It gives us an immense pleasure to know we have sold a unique fashion accessory made with love. But we must admit, having the opportunity to go to Croatia and meet the designers is also a highlight. Whether sitting in a café talking for a few hours over a coffee or seeing the designer working to produce an amazing product, we love the fact that most of our products are handmade and designed by Croatians that are passionate about their work and love what they do. How would you sum up your mission? Our goal is twofold. Our first goal is to bring quality handmade products to consumers in Australia & New Zealand that is different and makes them stand out from the mainstream fashion that is available here. Our second goal is to promote fashion accessories from Croatia and to help Croatian designers access the world market much more easily. We still have a lot of work to do but are excited to be on this incredible journey. We think success is a term that has many different meanings. We still have a long way to go to meet all of our goals but we still enjoy little successes and we are proud to have launched our store. I think one of the reasons of our success so far has been that we have met many of our designers in person and built a special relationship with each of them. This makes it easier for us to work together and collaborate with them on special designs and collections exclusive to Uppermoda. By building this relationship, we have opportunity to build custom collections that we feel have a nice blend between the Croatian and Australia fashion trends. We feel that it gives us a competitive advantage that big businesses aren’t able to satisfy as we are able to incorporate customer feedback and new trends quickly and easily. What are the future plans for Uppermoda? We still have a long way to go to fulfill all of our goals. We will continue to work with small independent designers from Croatia to bring unique Uppermoda capsule collections available worldwide. Our talented designers have beautiful pieces that we want to share with the rest of the world. We will continue to work with our current designers to increase their brand presence internationally so they are able to focus on the design and creation of their wonderful fashion accessories.